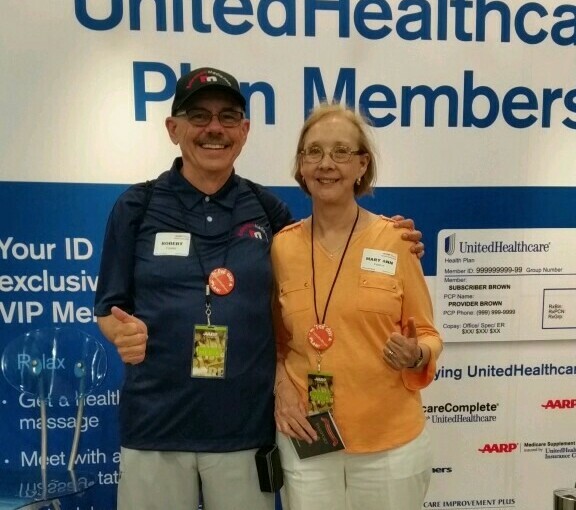 Strolling the exhibit floor here at Lifeat50+ in Miami, my wife Mary Ann and I came across the UnitiedHealthcare booth. We know them well as they are our Medicare insurance company for the last two years, so we asked to take a photo with them you see displayed at the top of this post. Two years ago, Mary Ann and I were among the millions of baby boomers turning age 65 and had to decide which Medicare insurance company to provide either Advantage or Supplement policies for us. Oh we got plenty of information, lots of mail almost everyday touting one company or the other. We were overwhelmed and just stacked the medicare mail in one large stack! However as time drew closer we signed up for basic Medicare as everyone must and went about trying to interpret this huge amount of information being thrown at us. The Medicare.gov site was a big help, providing a complete description of benefits of each plan offered in our area and we started to match up plans with each of our needs. So with the Medicare plans regulated and set by the government, there was only the matter of which insurance company we would go with, either for supplemental or advantage plans. We talked with several Insurance companies about Medicare coverage but at the end of the day both Mary Ann and I went with UnitedHealthCare Insurance Company. I went with the UnitedHealthcare Advantage Plan and Mary Ann went with the UnitedHealthcare Supplemental Plan. The reasons I chose UnitedHealthcare for my Medicare insurance was they are the single largest health carrier in the US with the biggest network and all my doctors accepted the plan I chose. I liked that they were endorsed by AARP. I also liked that a representative came out to meet with us in person and helped us match a plan to each of our needs. So last Fall Mary Ann and I were heading out to dinner with the neighbors when a pain developed in her side and she ended up in the ICU at Emory Johns Creek Hospital for 7 days. She had her gallbladder removed, but only after an extended bout of heart A-fib. Mary Ann has completely recovered now. Importantly to us, we didn’t have to worry about the Medicare insurance part. We just gave them Mary Ann’s UnitedHealthcare insurance card along with her Medicare card and that was that. I just asked Mary Ann if we had to pay anything for her hospital stay and she almost nothing. Her supplemental plan covered the approved charges not covered by Medicare. UnitedHealthcare’s Optum service has a nurse visit your home for a free evaluation and testing. This is a preventative measure that they take to make sure there are not any overlooked problems needing treatment. 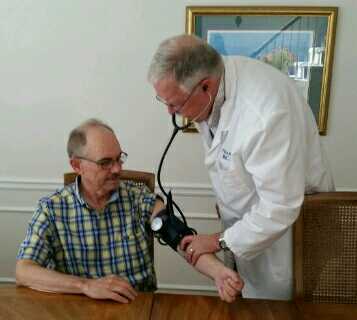 This is the photo my wife took of the practitioner testing my blood pressure at my dining table last week. Needless to say, during last December’s Medicare Open enrollment period we both stayed with our UnitedHealthcare policies. The UnitedHealthcare representative, the same one who came to our home a year earlier to help explain the plans, contacted us asking if we had any questions and to see how things were going. In my book, it is nice to have someone you have met with available for questions at any time. So seeing the UnitedHealthcare booth at AARP’s Lifeat50+, we just had to stop by and say hello. The baby boomer generation is really the first generation coming into retirement age with the knowledge that living into your 80s and 90s is a probability not an exception. The baby boomer generation is really the first generation coming into retirement age with the knowledge that living into your 80s and 90s is a probability not an exception. In fact, most financial advisors will tell you to plan your finances to age 100 reducing the chances that you will outlive your money. That means putting some things in place now to make sure your life is the way you want it to be when you are not so able to take care of or speak for yourself. 1. Talk to your family. Boy, do we hate talking with our family members about fundamental things like money, health, long term care and death. But here’s the deal. If you are going to count on them to help you when you are not so able, then you owe it to them now to tell them what you have in mind. It is truly a gift to let them know about what resources you have or don’t have; where your important legal documents are located and who you want to make important health decisions for you if you are no longer able. One resource to get you started is a document called 5 Wishes that helps you identify your preferences regarding medical, personal, and emotional needs when you can no longer speak for yourself. 2. Get your legal documents in order. Here are some of the legal documents that will make it easier for your family: a financial power of attorney; a medical power of attorney; advance directives, and a will. You can download a free copy of your state’s advance directive here or contact your states attorney general. If you have a financial planner or insurance agent who knows about all of your insurance and financial documents, introduce your children or whoever you will be looking to help you in your later years. 3. Consider long term care insurance. Medicare does not pay for long term care, except under very limited circumstances following a hospital stay. 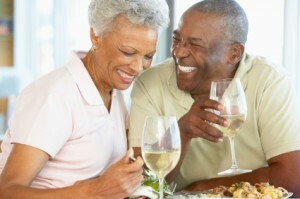 Long term care insurance helps pay for non-medical care when you can no longer care for yourself. That can be simply someone who comes in to help you cook, or assist with your medications or personal grooming, all the way to assisted living and nursing home care. Most plans include home care and can even help pay for modifications to your home so that you can stay there as long as you can. Speak with a specialist in long term care insurance who can help you determine if it is insurance that fits your needs. It’s smart to buy it when you are in your 50s or early 60s. The younger and healthier you are the more affordable the policy will be and the more likely you will be to qualify. 4. Think about where you want to live in your “slow go” years. The early years of retirement are often called the “go-go years” because you’re doing all those things you couldn’t do when you were working. There are great travel experiences. New friends. Maybe, a move to a new state with all the excitement of “starting over.” But if you live into your 80s and 90s that location may no longer be right for your “going slow or no go” years. And by the way, admit that at some point you will no longer be able to drive so consider transportation alternatives in the community. So consider now where you will be best suited to live when you hit that stage of life …and then do you and your family a huge favor and make the move before you have to. It is hard to think about a time when you can’t take care of yourself as you have for years. But if you do the rewards are plenty. Laura Rossman has over 20 years of experience in health and senior care services. She currently heads up marketing and communications for iQuote by Longevity Alliance, an independent national insurance broker who helps seniors compare Medicare insurance and long term care insurance from multiple providers.